by gillian claire: chasing the moon. Last Monday, April 20th, I was driving home from work and saw the most amazing crescent moon. April 20th was Easter last year and even though I have the flightiest memory imaginable, I remember that the 20th was Easter and I remember vividly the events that occurred in my father's last week of life because time seemed to stop and tick by slowly and deliberately. As I drove home last Monday, I decided to drive up the mountain road behind my house to the little spot where I scattered flowers on my dad's birthday last year, to think of him under the light of the biggest most beautiful moon. The raw emotion of trying to find a spot closer to him flooded over me and as I drove higher up the road, I watched the moon start to sink below the mountain peaks. Staring at that last little sliver peeking out as I drove over the dam, I felt panicky wanting the moon to hang on. It's the same panic I felt last year, hearing the words of many telling me that my dad was passing away but wanting him to hang on, filtering through the events that happened but desperately wanting it to not be true. As the moon sunk low, I felt gypped. I wanted my moment; to climb in the night and feel the stillness of the huge Colorado sky, to feel comforted by that quintessential crescent moon hanging over the mountains and to feel my father in the stillness I'd find there. As I got to our spot, the moon finally slipped away and the light that brought me there was gone. When I pulled into the little parking lot at the spot I was looking for, I realized that 4/20 to me is different than to the community up there who were dancing around with light sabers, smoking weed to celebrate and adding the perfect punctuation to my disappointment. It was then I realized that I was silly to try and chase the moon. I'm grown up now and I should know that I can't always catch the things I want. I know tragedy and big pain and have struggled with the best of them. I can't catch the moon and I can't hold onto it's light. I can't have my dad back on Earth with me. As hard as I freaking try to wish these things into reality for myself, they will not come true. Driving down the mountain that night, crying and sorting through ideas too big to ever truly understand, I felt a weird sense of truth washing over me. It's the sort of thing that only happens after losing someone close to you; you figure things out on a deeper level than you ever have before. I do know that I'll find the moon again, that every night it will be back, standing strong in the sky. I also know that when I take a step back from the giant pain of losing my father, when I climb down that mountain a couple of steps, he's there shining in my life as well. In everything I feel my father; I feel him close, I hear his laugh, I feel his approval wash over me when something goes right in my life. It almost seems that a person is more alive after they die. 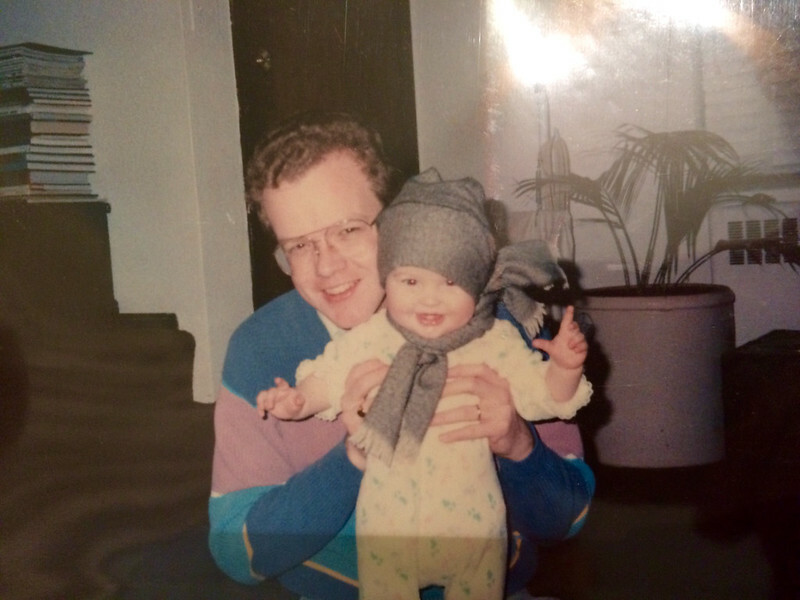 Before, my dad was a person; he existed in constant phone calls and texts, Thursday night dinners at Namaw's house and Christmas Eve sleepovers. He still exists, but now he is scattered everywhere. In the wind I feel his memory, in the future I feel his presence and I see him right there in front of me when I look into my babies' eyes. He's with me somehow everyday and every night he's shining with the light of the moon. I can't catch him or pin him down but if I sit back and close my eyes, I can feel his warm glow, and I always, always will. Gillian, I am in tears. This is so beautifully written. Big hugs and prayers always! lifebankUSA + a carseat giveaway!